Judd had this work produced by an industrial mill, resulting in its sleek, manufactured look. The artist's ideal was to make objects unified in color, shape, and surface that were neither sculpture nor painting, but what he called "specific objects." The bold yellow coloring is just another step in the machine process that created the work. Nothing was added or done to it outside of its mechanical fabrication. This work is nicknamed "bullnose" in reference to a particular type of chisel. Judd was undoubtedly pleased by the analogy between his work and a practical tool. In 1965 Donald Judd coined the term “specific objects” for his works unified in shape, color, and surface material that are neither sculptures nor paintings, and that, according to the artist, deal in the medium of space, which he felt transcended the limitations of the two-dimensional picture plane. Made by an industrial mill to his specifications and fabricated out of wood, metal, or Plexiglas, Judd’s “specific objects” are considered icons of 1960s Minimalism, although the artist contested both the movement’s name and his association with it. 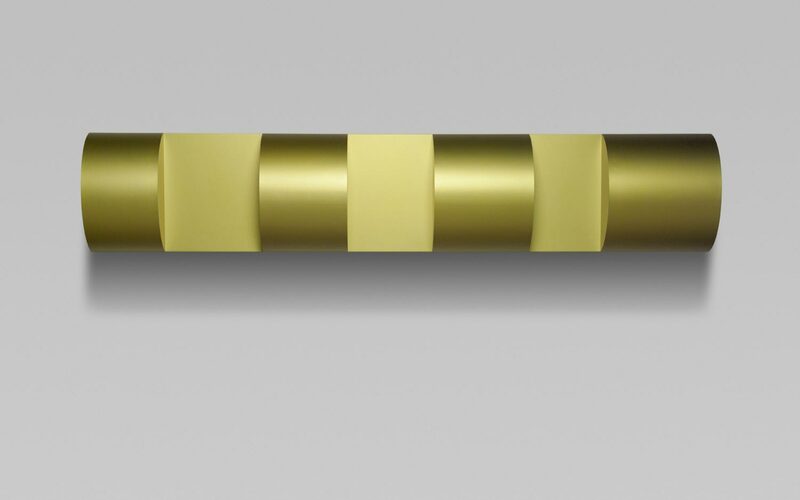 In this 1974 sculpture, from a series known as his “bullnose” works after a kind of chisel, Judd heightened the effect of the industrial, sleek surface through the use of bold yellow color. Erica Battle, from Philadelphia Museum of Art: Handbook. Philadelphia: Philadelphia Museum of Art, 2014, p. 374.